Built-in Wi-Fi with NFC allows you to wirelessly transfer images to a linked mobile device and Bluetooth pairing allows you to easily connect to smartphones or tablets to permit remote control over the camera from your device using the Canon Camera Connect app. 64GB ULTRASPEEDÂ SDHC/SDXC UHS-I MEMORY CARD- Take better pictures and Full HD videos with your compact to mid-range point and shoot camera or camcorder. With UHS-I cards youâll benefit from faster downloads and better performance to capture and store up to 64GB of high quality pictures and Full HD video. Take advantage of ultra-fast read speeds of up to 48MB/s to save time moving photos and videos from the card to your computer. 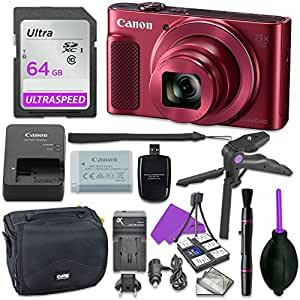 Characterized by its long-reaching zoom, the Red PowerShot SX620 HS from Canon is a sleek digital camera featuring a high-resolution 20.2MP CMOS sensor along with a powerful DIGIC 4+ image processor. The sensor and processor combine to form the Canon HS SYSTEM, which produces imagery with notable clarity and quality, as well as reduced noise when working at high sensitivities in low-light conditions. The sensor and processor also permit recording Full HD 1080p video at 30 fps, shooting stills at up to 7.1 fps, and working with sensitivities up to ISO 3200 to suit shooting in difficult lighting conditions. Complementing the imaging capabilities is a 25x optical zoom lens, which covers a wide-angle to super telephoto 25-625mm-equivalent focal length range, and Intelligent IS serves to balance this reach by minimizing the appearance of camera shake for sharper handheld shooting. The sleek form factor of the camera is accented by a large 3.0″ 922k-dot LCD screen for composing imagery and reviewing your shots, and built-in Wi-Fi with NFC enables wireless sharing and remote camera control from a linked smartphone or tablet.